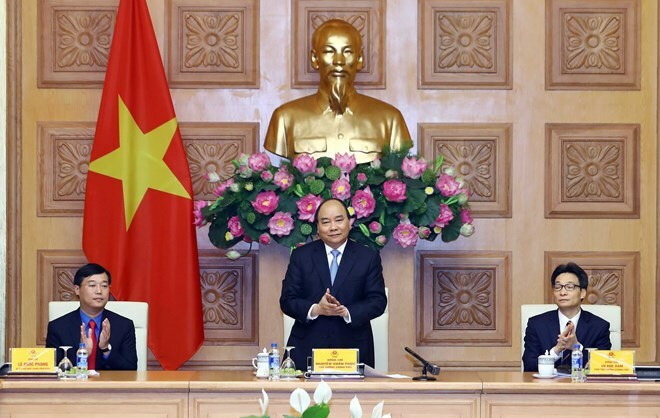 Hanoi (VNA) – Prime Minister Nguyen Xuan Phuc on March 20 called on young people to continue promoting their voluntary role in the implementation of the country’s common tasks involving labour issues, economic development, cultural preservation, political stability, and defence-security reinforcement. He made the statement while working with the Ho Chi Minh Communist Youth Union Central Committee in Hanoi on the occasion of the Youth Month 2019. The PM asked youth union organisations to focus on building a generation of young people with sufficient capabilities, qualifications, skills, and spirit to meet the requirements of nation building and defence in the context of international integration. Besides reforming activities to attract more youngsters to the revolutionary movements, especially in disadvantaged areas, the PM suggested arousing aspirations and passion for science and technology among young people. He ordered the encouragement of young people’s interests by creating more favourable conditions for them to access learning opportunities and develop their working skills. The Government leader directed local authorities at all levels to pay special attention to job generation and career guidance as well as culture, art, sports, and entertainment activities for youngsters.